Don’t assume that designer wedding dress you’ve set your heart on is out of your price range. Here are some pointers for finding fabulous gowns at a price that you can afford. The hunt for the perfect wedding dress can be one of the most exciting and entertaining parts of the preparations leading up to your wedding day. Should you go for a chic, contemporary sheath or for a billowing romantic gown that makes you look as though you just stepped out of a fairytale? Should you opt for an off-the-rack dress or a designer style? It is possible to find a reasonably priced designer wedding dress in Columbus if you know where to look. Here are some tips. Bridal salons frequently host trunk shows where gowns are showcased that are hot off the designer runway. Typically, trunk show collections are not yet available in stores, so they’re a great way for an enterprising bride to snag a truly unique gown. Frequently, designer representatives travel with the garments that are on display, and these reps are generally happy to give tips for customizing and tailoring the gowns they’re showing to personalize them even more. Trunk show dresses also come with sizable discounts. You may also be able to score a preowned designer wedding dress through an online classified ad or auction sites. You’ll need to be extra careful when you shop this way. If possible, avoid buying a gown from someone who doesn’t have the same type of body that you have. You’ll almost certainly end up having to make some alterations to the gown, but it’s easier to do that if the gown’s previous owner is your size. Make sure accompanying photographs display the gown from every angle, and if you’re not sure about a detail, set up a video chat with the seller so that you can check that detail out. 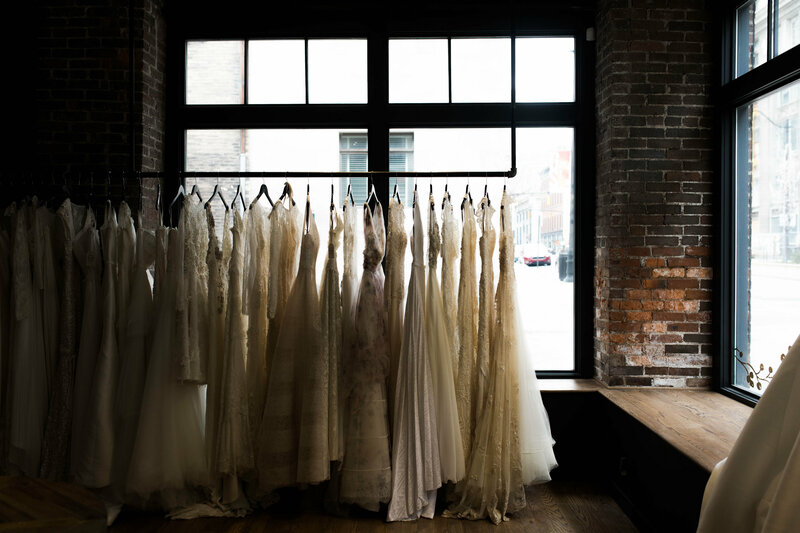 Bridal retailers usually hold two mega-sales every year in the spring and in the fall to clear their racks for new inventory. Prices can be slashed by as much as 80 percent, so you’ll definitely want to go. Don’t buy a dress just because it’s deeply discounted, though. Your wedding day is about making your wishes come true, and you deserve to have the wedding gown of your dreams, however you come across it.